If you have booked an apartment at Landrucci, it is possible to take part in 2 or 3 day walks per week (subject to enough participants). These guided walks are offered for the weeks 18 April, 2 May (provisionally), 20 June and 19 September. For more information on the apartments, look under "Accommodation". Double/Twin rooms are available for rent in the months June and September. At country house Landrucci Lucia has a choice of 15 very special day walks. The choice of walk is by consensus, but also depends on the time of year and the weather. The duration of the walks varies from 3 to 7 hours (excluding breaks). Along the way there is so much to see and do, that most of the times you are away for the whole day. But of course it is always possible to opt for a shorter (or longer) walk. Lucia is the guide on these walks and provides participants with the necessary information in advance. Lucia also arranges check in on arrival for guests at Landrucci, where you can register with her. If you are interested in day walks, it helps to let us know this in advance. For instance when you make your reservation for apartment or room. Prices vary from €30,- to € 60,-. The price depends on transfers, possible entrance fees, the walk and how often you come along. For friends, or for children who want to spend a holiday day without their parents, for families, for beginners, for experienced hikers, for adolescents and/or 55 plussers. Anybody staying at Burciano in summer can take part in single day walks. These Tuscany - Umbria walks are in the area between Arezzo, Perugia, Lake Trasimeno (Orvieto) and Siena/Montepulciano. Anybody can join the special family day walks (elderly, singles, couples, quiet people, hyper people), but keep in mind that first of all the programme is geared around the children. Which day walks are chosen depends on participants, interests and experience. For unexperienced walkers amongst kids and adults, there are three very special walks which suit anybody. During this walk Lucia can judge which other walks would suit the children (and possibly the adults). The walks from the campsite are adapted to the summer heat, and mostly shorter. Again, the price depends on the walk, possible entrance fees, boat trip and transfers. Prices from € 15 to € 60. The prices of the children's walk (parents are excluded from these walks) are from € 15. This is inclusive of your guide Lucia and the help of an extra assistent. 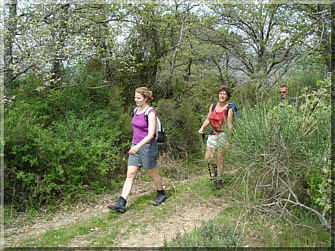 More information on day walks can be found on Fattoria Landrucci or Camping Burciano.